Lowest prices all the time, guaranteed! If you find a better price, let us know. Windward Port Quilt bedding by C & F Enterprises sets a scene as crisp as the brisk wind against a sail. The quilt has sailboats and nautical flags in navy, red, and blue on a white background. Some of the sails are labelled to add to your nautical expertise. Self binding trim at edges. Quilt and shams reverse to a blue and red ticking stripe on white. Set includes one quilt and two shams. Display the quilt against a navy backdrop with euro shams and a bedskirt. A flag pillow adds more nautical flair. Sail into the bath with a shower curtain in the quilt print. The Windward Port Twin 2 Piece Quilt Set has sailboats and nautical flags in navy, red, and blue on a white background. Some of the sails are labelled to add to your nautical expertise. Self binding trim at edges. Quilt and shams reverse to a blue and red ticking stripe on white. Set includes one quilt, 64"W x 86"L and one standard sham 20" x 26". 100% cotton cover, 80% cotton/20% polyester filling. Machine wash, line dry. We offer the complete ensemble in the Windward Port pattern by C & F. Manufacturer's UPC code is 008246506454. The Windward Port Full Queen 3 Piece Quilt Set has sailboats and nautical flags in navy, red, and blue on a white background. Some of the sails are labelled to add to your nautical expertise. Self binding trim at edges. Quilt and shams reverse to a blue and red ticking stripe on white. Set includes one full queen quilt, 90"W x 92"L and two standard shams 20" x 26". Fits full and queen size mattresses. 100% cotton cover, 80% cotton/20% polyester filling. Machine wash, line dry. We offer the complete ensemble in the Windward Port pattern by C & F. Manufacturer's UPC code is 008246506423. 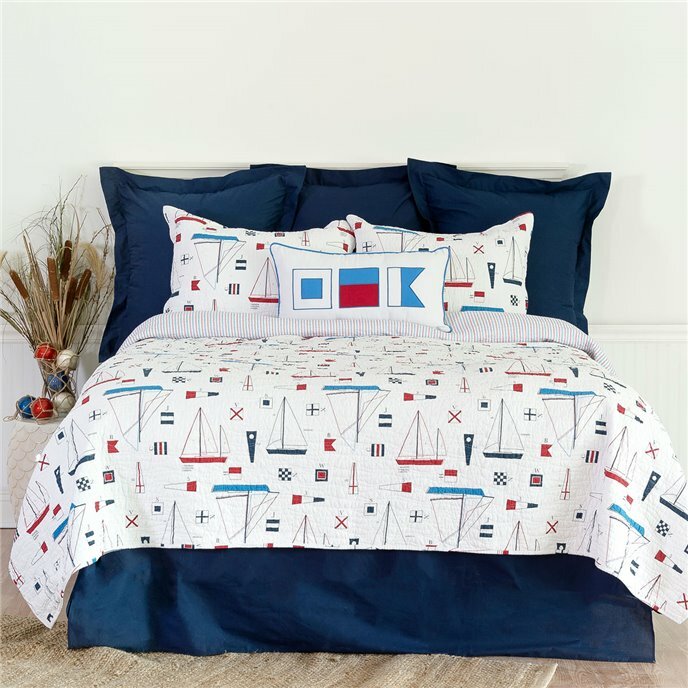 The Windward Port King 3 Piece Quilt Set has sailboats and nautical flags in navy, red, and blue on a white background. Some of the sails are labelled to add to your nautical expertise. Self binding trim at edges. Quilt and shams reverse to a blue and red ticking stripe on white. Set includes one quilt, 108"W x 92"L and two king shams 20" x 36". 100% cotton cover, 80% cotton/20% polyester filling. Machine wash, line dry. We offer the complete ensemble in the Windward Port pattern by C & F. Manufacturer's UPC code is 008246506430. Flanged euro sham in navy blue. Euro pillow insert not included. Product: 1 euro sham. Product Measurements: 26 x 26. Material: Cotton. Care instructions: machine wash. Maker: imported, made by C & F Enterprises. Flanged euro sham in solid red. Euro pillow insert not included. Product: 1 euro sham. Product Measurements: 26 x 26. Material: Cotton. Care instructions: machine wash. Maker: imported, made by C & F Enterprises. Navy tailored split corner bedskirt. 39" x 76". Navy tailored split corner bedskirt. 60" x 80". Navy tailored split corner bedskirt. 78" x 80". The Windward Port Applique Flags Pillow has nautical flags in blue and red on a white background. Blue piping trim at edges. 12"H x 24"W. 100% cotton cover, polyester fill. We offer the complete ensemble in the Windward Port pattern by C & F. Manufacturer's UPC code is 008246506645. The Windward Port Shower Curtain has sailboats and nautical flags in navy, red, and blue on a white background. Some of the sails are labelled to add to your nautical expertise. Self binding trim at edges. 72"W x 72"L. 100% cotton. We offer the complete ensemble in the Windward Port pattern by C & F. Manufacturer's UPC code is 008246506461.